The ETEKT + has been serving an important role for glaziers worldwide for nearly 25 years: locate invisible Low-E coatings on IG units with a definitive, non-destructive test. With the release of the AE1601 (second generation ETEKT+), we've made some improvements to the reliability and temperature stability of the meter without compromising the features our customers have grown to love. Confirm the invisible Low-E coating is properly installed on your double pane IG units with a single test from a single side. You can also test a triple pane window by testing both sides of the window. For full triple pane Low-E detection, see the Glass-Chek PRO & Glass-Chek ELITE. During IG fabrication, ensure proper orientation of the Low-E coated glass so it is not damaged by the brushes of the glass washer. Prove to the customer that the invisible, money saving Low-E coating is present on their windows before installation. 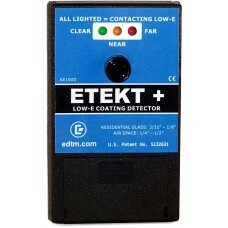 Being handheld in size and powered by a common 9-volt battery (included), the ETEKT + is completely portable. Compatible with 3/32" through 1/4" SINGLE pane of glass. Also compatible with 3/32" & 1/8" IG assemblies with 1/4" - 9/16" air space from a single side. Thicker IGs, as well as larger air spaces, can be tested in single pane mode. New: Low Battery Indicator. The Low-E detector will indicate that the battery needs replaced by blinking the LED indicators. New: The AE1601 is much more capable of maintaining accurate results across a wider range of temperatures due to a new temperature stability program incorporated into the design. Close-up of AE1601 test results. All three lights indicate the meter is contacting the Low-E Coating. 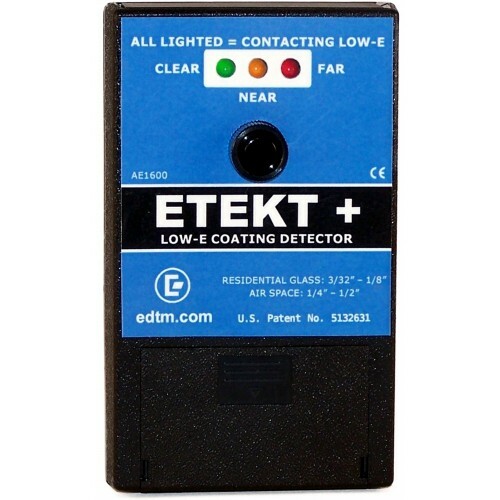 The ETEKT + Low-E Coating detector is the industry standard for instruments detecting the presence and location of thermal resistant coatings (Low-E) used on energy efficient single, dual and triple pane glass and window assemblies. The ETEKT+ is a rugged handheld device that is accurate, easy to use, and rarely requires calibration. Place the unit flat on the glass surface, press the button and read the results. NEW: AE2250 Low-E CARD+ - Replaceable Battery The AE2250 Low-E CARD+ offers a replaceable battery design that can be used indefinitely. This "+" model will differentiate if the Low-E coating is on Surface 1, Surface 2, or indicate if the..
NEW: AE2200 Low-E CARD - Disposable The AE2200 Low-E CARD is a disposable model that will allow 1,000 tests to be conducted. It will confirm if there is a Low-E coating present on the piece of glass you place it against. The AE2200 ..
"RefleX" Programmable Coating Detector The first meter of its kind that can be programmed in the field to identify new coatings. Program the meter to detect first surface coatings Users can store calibrations of new coatings that can be tested in ..
DS1670 DiamondGuard/ShowerGuard Dual Coating Detector This NEW dual-purpose detector combines two instruments into one. Use the same device to identify the coated surface of glass for either the ShowerGuard or DiamondGuard coatings available from Gu..